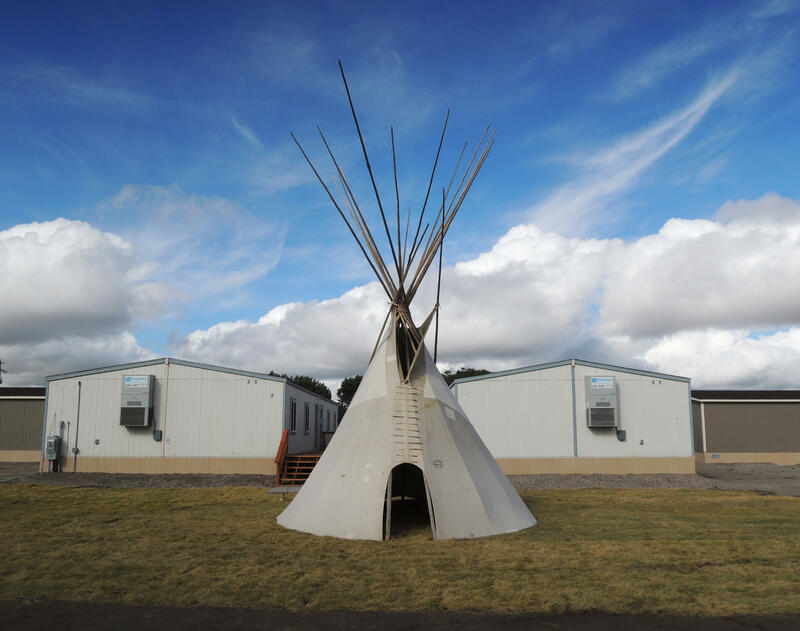 This new kindergarten classroom on eastern Idaho’s Fort Hall Indian Reservation looks and feels much like any other. Tiny tables and chairs fill the room, bright drawings and artwork hang on the walls, and small coats hang on low-to-the-ground hooks. It’s the sound of the classroom that’s truly one-of-a-kind. 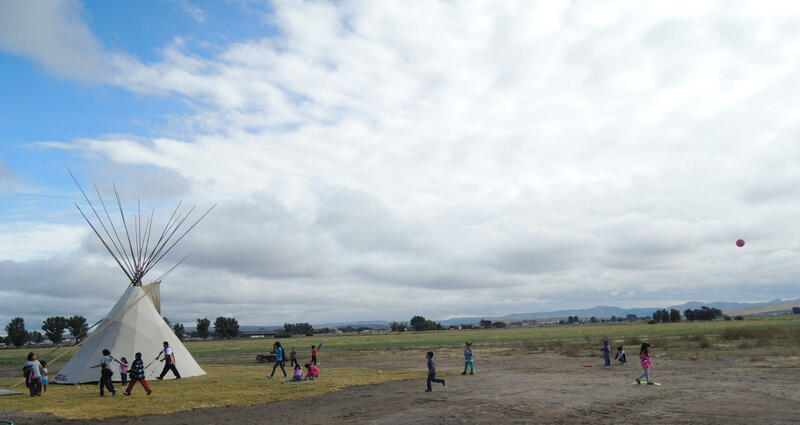 About 30 five-and-six-year-olds are learning to speak Shoshone. Abrahamson tells some students a traditional story in Shoshone. She acts out the different characters. Here she's playing a bear. The kids line up to introduce themselves. Benna is a traditional greeting like hello. Ne naniha means my name is. But the fist-bump each kid gives me as they introduce themselves isn’t an historical part of Shoshone-Bannock culture. These kindergartners at Chief Tahgee Elementary Academy in Fort Hall are attending Idaho’s first public Native American language immersion school. It’s a charter school for students grades kindergarten through sixth. In the immersion model, teacher Rose Ann Abrahamson can’t speak any English to her students. Even when a kindergartner notices one of her fellow classmates gets a nosebleed, the response comes in Shosohone. “Teacher, teacher, Michelle’s nose is bleeding,” the student shouts across the room. These kids don’t yet know how to say most of that in Shoshone, so she speaks English. But Abrahamson responds tenderly in Shoshone as she swoops in with tissues. 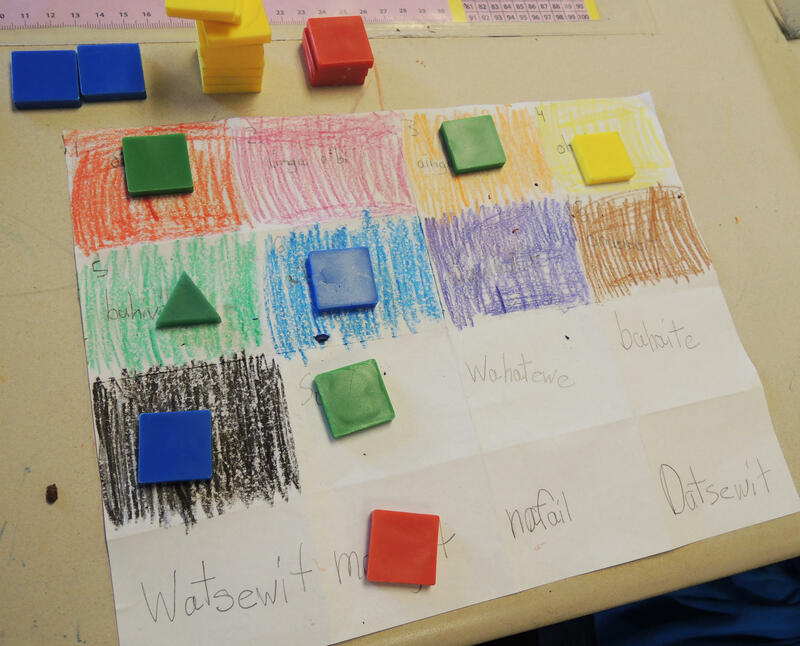 “My students are basically learning all academic contents a child would learn in kindergarten, except they’re learning it in our language, they’re learning it in Shoshone,” Abrahamson explains. According to the U.S. Census Bureau, there are about 2,000 Shoshone speakers in the country. The Shoshone-Bannock tribes' total membership is about 6,000. The tribes are concerned the language is dying. The tribal government has offered language classes for years. Shoshone is offered at the local high school and at Idaho State University. But the Shoshone-Bannock tribal culture department decided the traditional class model wasn’t working to create a generation of fluent speakers. How many of us are fluent Spanish or French speakers after a few years of high school classes? Eunice Romero-Little says many native communities have found themselves in similar situations. Romero-Little teaches Native American Studies at Arizona State University and studies language revitalization. “What people have been turning to, and has been proven over and over again to be one of the most successful ways to revitalize a language, is using immersion,” Romero-Little explains. She says many Native American communities now have immersion schools like Chief Tahgee. But most, she says, are privately funded and run. Chief Tahgee founders decided the tribe could not afford to create its own private school. So they got state approval to create a charter school. It’s independent of any school district, but it is funded by the Idaho Department of Education. Students at Chief Tahgee Elementary Academy play at recess. The school opened on time but some things were left undone. Walls and ceilings in the office remained unfinished and parking lot and playground are bare dirt except for a few yards of new sod. There are other public native language immersion schools including in Hawaii, Arizona, and New Mexico. Romero-Little says being a public school brings challenges. One of which is finding teachers. “Certified as teachers, as well as fluent in the language, this has been one of the challenges of many of these school based programs,” says Romero-Little. Chief Tahgee's third graders are in about the same place as the kindergartners when it comes to learning Shoshone. They're playing a game of bingo using the names of colors and shapes. Chief Tahgee must have state-licensed teachers just like any other public school. They have four teachers now but only one, Rose Ann Abrahamson, speaks Shoshone. She’s teaching the only immersion class this year. 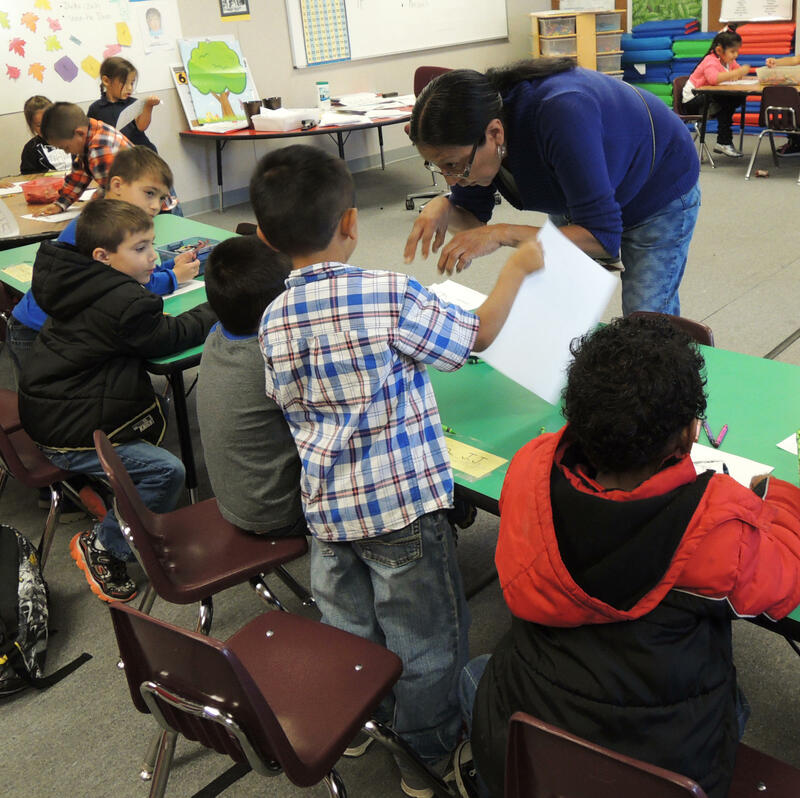 The other three classes, combination first and second grade, third and fourth grade, and fifth and sixth grade do most of their work in English with daily Shoshone lessons. School leaders want to add an immersion class each year until all grades are taught in Shoshone, which means they’ll need a new state-certified, Shoshone-fluent teacher each fall. That, they say, will be one of their biggest challenges. Abrahamson is rare. She grew up in a primarily Shoshone-speaking home. She credits her grandmother for that. “My mother’s mother hid her children from the boarding school police officers who were on the reservation dragging children into the boarding school,” Abrahamson remembers. The boarding school system is a big reason why so many Native American languages are on the verge of extinction says Arizona State’s Romero-Little. From the 1870s to the 1970s, the federal government’s policy was to remove native children from their homes and send them to boarding schools. Romero-Little says the goal was to eradicate native culture. Children were taught that being Indian was bad. She says generations internalized that message and chose to speak only English at home. Romero-Little says language revitalization is at the heart of the contemporary American Indian movement which wants native communities to be proud of their cultures. Abrahamson agrees. “The language holds our culture, our deniwape,” she says. Deniwape is an important word in Shoshone. It can translate to teachings, or customs. It was for deniwape that parent Michelle Hautz-Zaharias says she enrolled her twin sons in Abrahamson’s class. Chief Tahgee Elementary still has the same requirements and pressures all public schools have, including maintaining scores on standardized tests. Chief Tahgee Elementary Academy consists of four modular buildings. The tepee is not a permanent fixture. It was set up for a Native American Day celebration. That's a holiday in some states but not Idaho. The school has to get students proficient in math, English and reading while teaching in another language. They’re betting that positive academic results sometimes associated with bilingualism will work for them. The public immersion schools in Arizona and New Mexico give them hope. Those schools have had high academic achievement while teaching kids to speak their native language. Hautz-Zaharias says her family has lived on the Fort Hall Reservation for generations, but haven’t learned their native language for decades. She says now, just a few weeks into the school year, she’s learned more Shoshone than she has in her lifetime. “My dad, who lives next door to us, is quite excited that his grandsons are coming here so that they can teach him,” Hautz-Zaharias says. New figures from the U.S. Census Bureau show the Northwest has fewer people who speak a foreign language at home than the country as a whole. Census data show 10.4 percent of Idahoans speak a language other than English in their homes, while the national average is 20.8 percent. Do you know what a sunshower is? Chances are you're not from Idaho if you do. If you say "pop" when referring to a sugary can of carbonation, you're more likely to be from Coeur d'Alene than Boise. And when it comes to what Boiseans call a sale of unwanted stuff, it's kind of a toss-up: "garage sale" and "yard sale" are both acceptable terms.